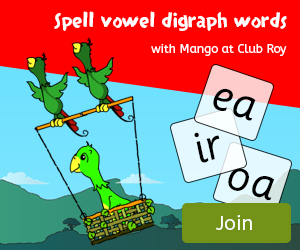 Learn words that rhyme with our games below, there are three to choose from and more versions of these reading game themes on Club Roy. Please register if you intend on using these games. 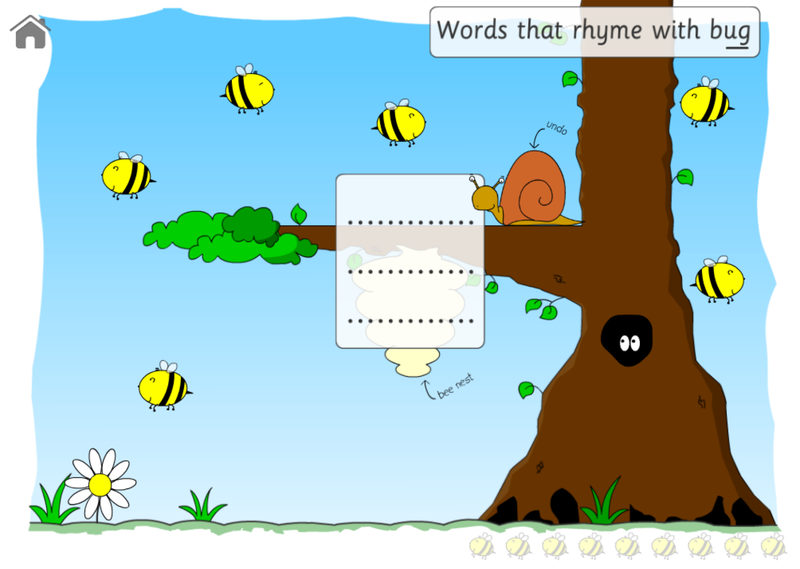 In this words that rhyme reading game, the bees are hiding words that rhyme with bug, click on them to find the word and then if the word rhymes with bug take them back to their nest. We have lots of words that rhyme games at Club Roy for you to enjoy. Once the reading game has loaded you will see the introduction screen, read the instructions and then click the start button. All the bees have words behind them. To see the word click, or touch and hold, the bee. The word will appear and you'll also be able to drag the bee around the screen. What word have you found? Does it rhyme with bug? If it does then drag the bee and the word to their nest (the empty box hanging from the tree). If it doesn't rhyme with bug then let go of the bee and leave it alone! 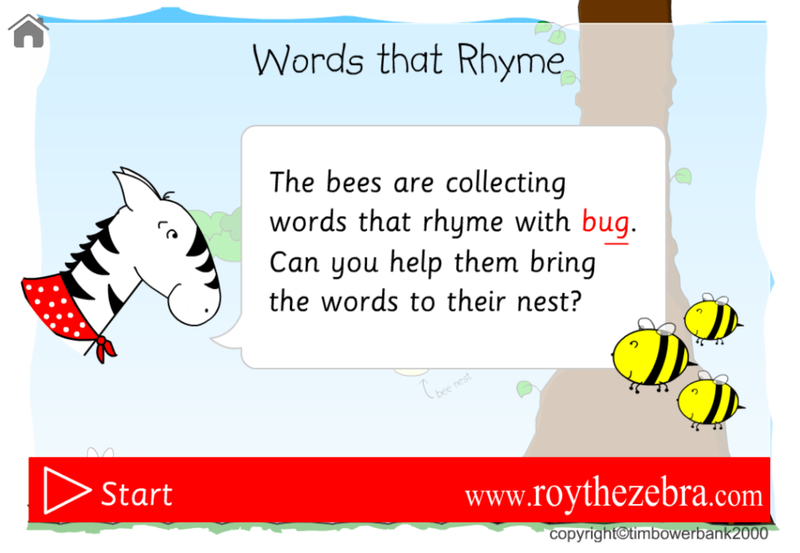 The reading game will detect when the bees' nest is full of words and will then automatically mark the words, checking to see if they rhyme with bug. If they do then the flower will grow - well done! If you have found all the words that rhyme then you can move on to find more bees and help the flower grow even more. Keep an eye on how many bees you need with the bee scorecard in the bottom right corner. 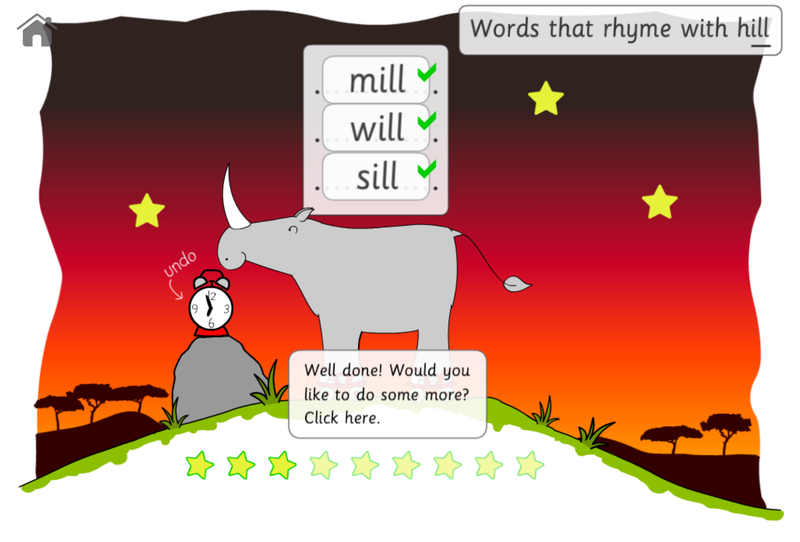 If during play you get an answer wrong then you can click or touch the snail to undo the last answer. To quit the reading game click the home icon and it will bring you back to this page. Have fun playing the words that rhyme with bug game! 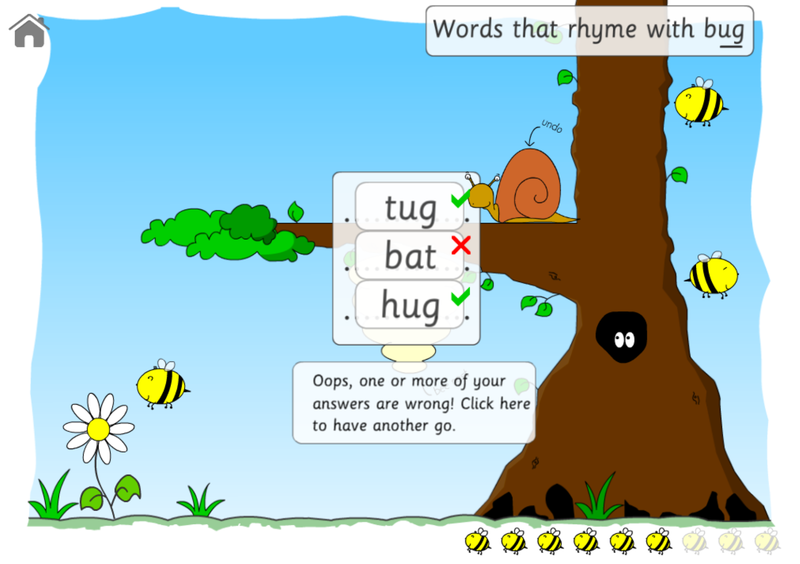 This reading game has animated bees, wrong answer tree snake, animated growing flower, bee scorecard and sound effects. 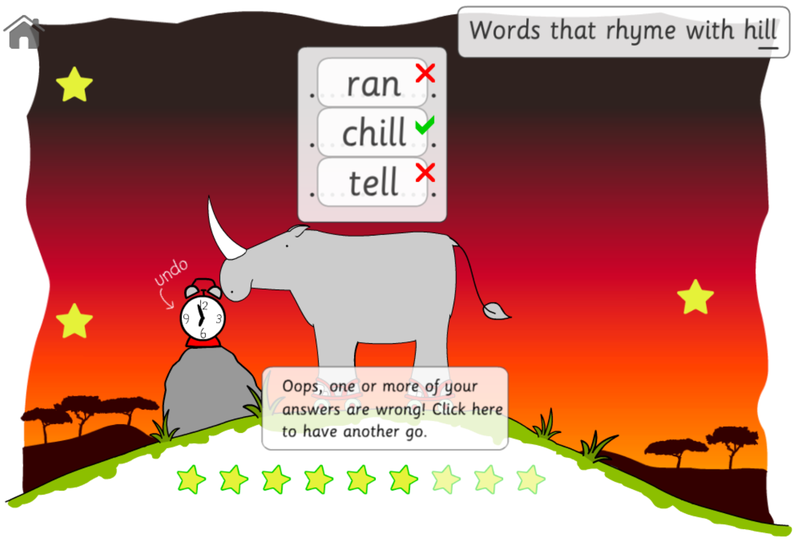 The words that rhyme game can be played on iPads, Android devices, Mac desktop and laptops as-well-as Windows machines. Works well on a wide range of browsers including - Internet Explorer, Chrome, Safari and Firefox. Our preferred browser is Chrome but use what is best for you. Belinda, our chicken, loves eating apples. 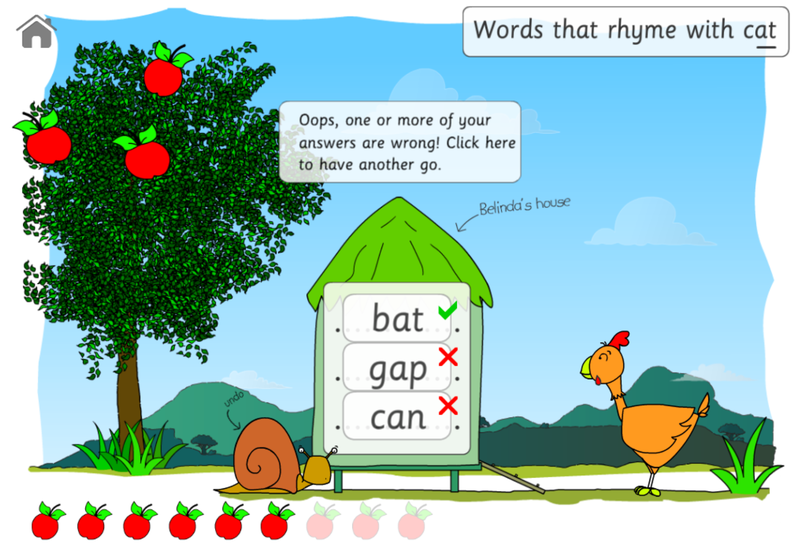 In this words that rhyme reading game, the apples on her tree are special rhyming apples and are hiding words that rhyme with 'cat'. Find the apples that rhyme with 'cat' and bring them to Belinda's house so she can have a lovely meal of apples. Allow the reading game to load, once loaded the intro screen will appear. Read the instructions and then click start to begin the game. Click, or touch an apple and it will show you the word it is hiding. 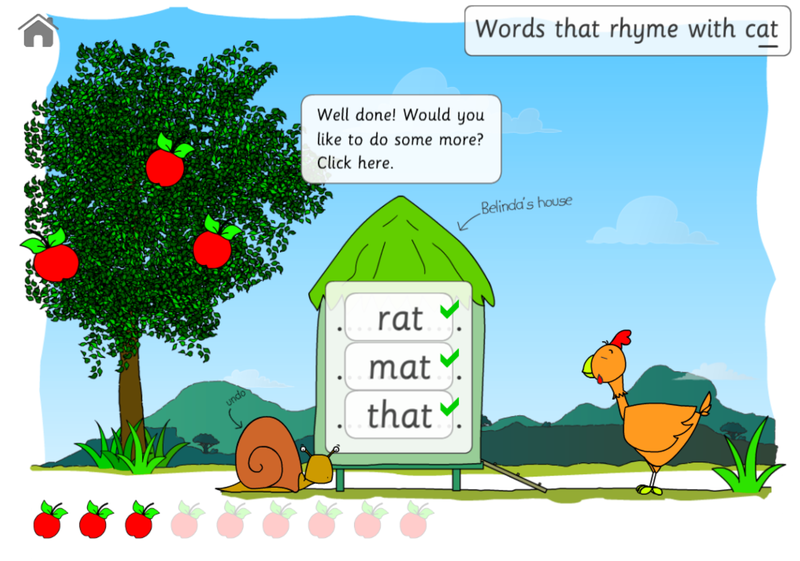 If the word rhymes with cat, then drag and drop the apple on Belinda's house - where the empty word box is. The reading game will notice when the word box is full and will automatically mark your words. If you have found all the word apples that rhyme with cat then Belinda will be very pleased with you. Don't worry if you make a mistake and get some answers wrong as you'll get another go. Also, if you make a mistake during play then you can click the snail and it will undo your last answer. Click the home icon to quit the reading game. Watch how many apples you can collect for Belinda using the apple scorecard. Will you get them all? 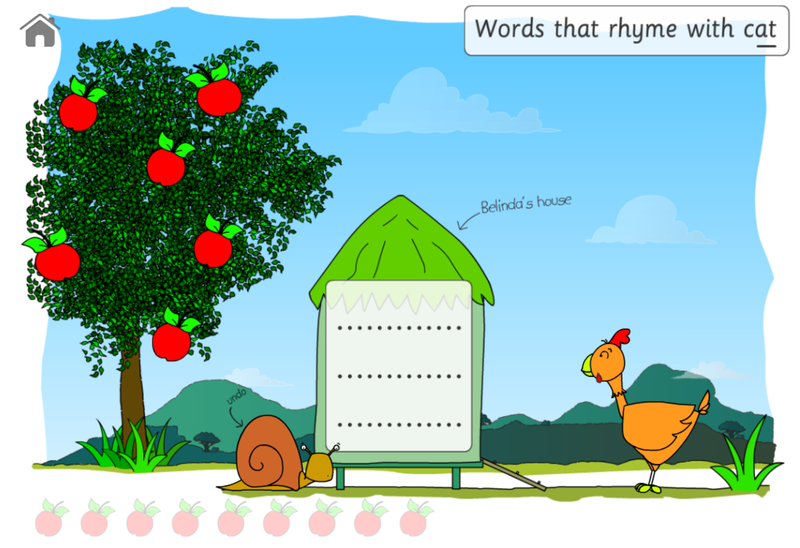 A words that rhyme game that includes animated Belinda the chicken, animated snail, apple scorecard, drag and drop word apples, sound effects and easy to use interface. The reading game is compatible with iPads and Android devices. Can be used with the following web browsers - Internet Explorer, Chrome, Firefox and Safari. It's a wonderful starry night in the savanna and Ryan is excited because he has spotted some words that rhyme behind the stars, he's also got his roller skates on and really wants to show you how good he is at skating. 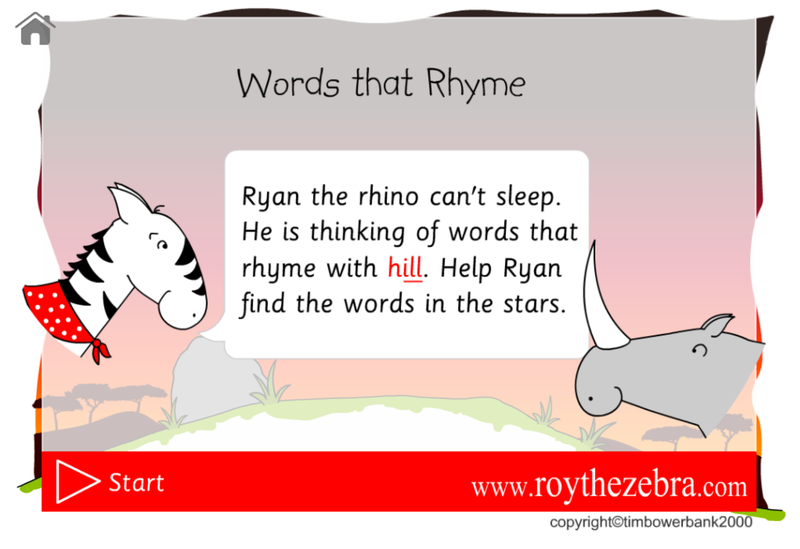 In this reading game find the words that rhyme with 'hill' and add them to Ryan's word box. If you like this reading game then you can found another 14 words that rhyme games at Club Roy. Wait for the words that rhyme game to load and once loaded you will see the introduction screen - read the instructions and then click the start button. The first screen shows Ryan with a starry sky, click or touch the stars to see the words. If they rhyme with hill then drag and drop them into Ryan's word box. You can undo any answer by clicking on the alarm clock. The reading game will detect when Ryan's word box is full and will then mark your words, hopefully they all rhyme with hill. If they do then Ryan will show you how good he is at roller skating! If you don't have all the answers right then don't worry, you'll get another chance to find the words that rhyme with hill. Quit the reading game by clicking on the home icon and it will bring you back to this screen. 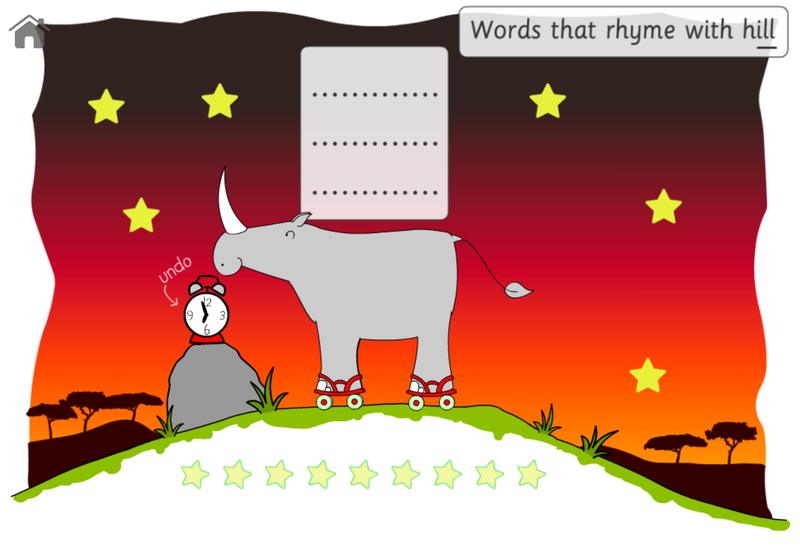 Animated Ryan the rhino on roller skates, animated alarm clock, animated star dust, drag and drop stars, and star counter scoreboard. Use this reading game with iPads and Android devices plus desktop PCs, Macs and interactive whiteboards. Widely compatible reading game, can be used with the following browsers - Internet Explorer, Firefox, Chrome and Safari. We recommend always keeping your browser up-to-date with the latest version to get the best out of these reading games.